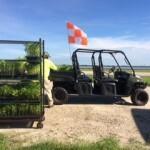 COCOA, FL – August 11, 2016 – Aquatic Plants of Florida, Inc. completed contract growing and plant installation work for the Cocoa – Merritt Island Airport. Plants were installed at a rate of approximately 9,000 units per day over a 6-day work period. 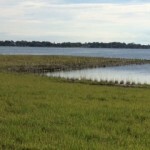 Plant species utilized on the project by zonation included: smooth cordgrass, saltgrass and dune sunflower. 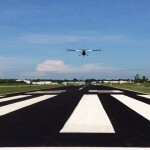 The overall project work included approximately 15,000 CY of excavation and embankment to extend the runway safety area (RSA) roughly 170′ into the Newfound Harbor. The extended and existing shoreline along the runway were stabilized with approximately 37,000 SF of Articulated Concrete Block (ARB). The project required permitting, dewatering operations, runway markings, and erosion control. The project also included several environmental components, which included: filling a mitigation area in the harbor, transplanting seagrass, plant installation, and environmental monitoring. 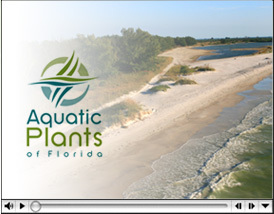 Other environmental aspects include improvements to an off-site mitigation area on Merritt Island. The improvements consisted of CMP culvert installation, erosion control, nuisance vegetation removal, and tree/herbaceous plantings.